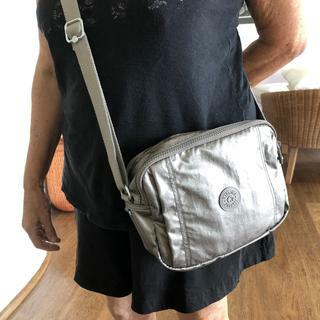 https://www.kipling-usa.com/benci-metallic-handbag/100262591.html Benci Metallic Handbag The Benci Handbag was designed with plenty of useful pockets, a handy key fob, and roomy interior so you can easily stay organized while out and about. Use the adjustable strap to wear the bag over the shoulder or as a cross-body bag for on-the-go ease. The Benci Handbag was designed with plenty of useful pockets, a handy key fob, and roomy interior so you can easily stay organized while out and about. Use the adjustable strap to wear the bag over the shoulder or as a cross-body bag for on-the-go ease. double large zipper, color and practical. What happened to the pink metallic color option? We are currently out of stock of the rose metallic.